Ask most Americans to name the most influential siblings in our nation's history and they'll probably think about politics (the Kennedy and Bush brothers), sports (the DiMaggio brothers and the Williams sisters), and show business (the Marx brothers, Maggie and Jake Gyllenhaal, the Osmonds, and the Jackson Five). It is unfortunate that the Reuther brothers (Walter, Roy and Victor), who built the United Auto Workers union that transformed the broader labor movement and helped build the nation's middle class, would probably not make the list because few Americans know much about labor history. A new documentary film, Brothers on the Line, may help remind America about these three courageous union organizers who deserve a place in the pantheon of America's social justice heroes. Even as we celebrate Labor Day, few Americans understand the crucial role that the union movement has played in improving the lives of working people in terms of better pay, safer working conditions, and improved health care, retirement, and educational opportunities. And, as events in Ferguson, Missouri unfold and draw attention to the persistence of racism in America, it is good to be reminded, as Brothers on the Line does well, that the Reuthers and the UAW were at the forefront of the civil rights movement, as close allies of Martin Luther King, Cesar Chavez, and other progressives. The film is currently available for rent or purchase on iTunes, Google Play, and Amazon Instant across the U.S. and Canada. The Reuthers would surely be upset about the current state of organized labor (which now represents only seven percent of private sector employees), but hopeful about some the resurgence of activism among fast food, hotel, hospital, port, Walmart, and other workers as well as the growing movement in cities around the country to raise the minimum wage. Brothers on the Line shows us that the struggle for workers' rights goes hand in hand with the battles for a more humane society. "We are the vanguard in America of that great crusade to build a better world," Walter Reuther told about 3,000 members of the United Auto Workers (UAW) at the union's 1947 convention. "We are the architects of the future." The 40-year-old UAW president was preparing his members, many of them military veterans, for another kind of war, one that would pit unions and their progressive allies against the increasingly concentrated power of big business, a war whose battlefields would be the shop floor, the bargaining table, the voting booth, and the halls of Congress. Walter was the best-known and most influential of the brothers, a household name in the 1940s, 1950s, and 1960s, whose photo adorned the cover of TIME magazine in 1945. But the film (produced by Sasha Reuther, Victor's grandson) makes it clear that Walter, Roy and Victor were part of a team who recognized that a successful union requires rank-and-file shop floor militants, mid-level strategists and "inside" activists, and visible public leaders who can inspire the nation, negotiate with corporate chieftans, and confer with presidents. All three began as shopfloor militants and eventually rose to prominence within the UAW. 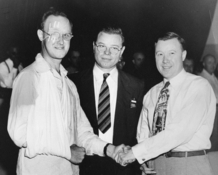 Walter was elected UAW president in 1946 and served in that position until he was killed in a plane crash in 1970. Victor served as head of its educational and later its international office. Roy became the director of the UAW's political department. The 80-minute documentary understandably spends more time on Walter than on his brothers, although Victor -- who was probably the most radical of the trio -- gets his due for his brilliant tactical maneuvers during the 1930s organizing drives, for getting the UAW to support democratic unions around the world, and for encouraging Walter to oppose the Vietnam war. Victor was the only one of the brothers still alive when his grandson made the film. He is a wonderful storyteller and the clips of his speeches and his interviews sprinkled throughout the film are a highlight. Roy, who as the UAW's political director, helped elect John F. Kennedy, used its influence to push Congress to enact Medicare, Medicaid, the Civil Rights Act, the Voting Rights Act and other key laws, and persuaded Walter to support the United Farm Workers, gets less airtime in the film. The film weaves together archival newsreel footage, tapes of speeches, narration by Martin Sheen, and interviews (with rank-and-file UAW members and union leaders as well as Reuther allies like Ted Kennedy, John Conyers, Dolores Huerta, and Andrew Young), and a few academics, most usefully labor historian Kevin Boyle. Brothers on the Line could serve as a basic introduction to key trends and moments of the 20th century, including the rise of mass production, the emergence of big cities, the exodus of blacks from the South to the North and Midwest, the social and political turmoil of the Depression, the rise of the auto industry as the lynchpin of post-war American prosperity, the battles to unionize the Big Three auto companies against outrageous corporate terrorism, the emergence of the civil rights movement, and the turmoil and conflict over the Vietnam war. (The film overlooks two key aspects of the Reuthers' story and the 20th century - World War 2 and the birth of the environmental movement). The Reuthers grew up in Wheeling, West Virginia, three of the five children of Valentine Reuther, a German immigrant, a Socialist, and an activist in the brewery workers' union. In 1919 Valentine took Walter and his brother Victor, ages eleven and six, to visit Socialist Party leader Eugene Debs at a prison outside Wheeling, where he was being held for his opposition to World War I. The visit made an indelible impression on both young Reuthers, who became committed Socialists. Walter quit high school at age sixteen and became an apprentice tool-and-die maker. He moved to Detroit in 1927, drawn by the Ford Motor Company's promise of high wages and a shorter workweek. He quickly established himself as one of the most skilled toolmakers at Ford's massive River Rouge plant. Victor and Roy joined Reuther in Detroit and on the assembly lines in the growing mass production auto plants. The exhausting and inhumane conditions -- speed-up, close scrutiny and anti-union intimidation by supervisors, the lack of job security, the blatant racism that assigned black workers to the most dangerous and dirtiest jobs -- led Walter to characterize the industry as a "social jungle" in which workers were "nameless, faceless, clock-card numbers." The Depression deepened the Reuthers' already radical outlook. Working nights, Walter earned his high school diploma at the age of 22 and took classes at Detroit City College (now Wayne State University), where he was joined by his younger brothers. Walter and his friends formed a Social Problems Club on campus and affiliated with the Socialist League of Industrial Democracy, organized protests against establishing a Reserve Officer Training Corps (ROTC) unit on campus, and protested the segregation of a local swimming pool leased by the college. In 1932 Walter campaigned for Socialist Party presidential candidate Norman Thomas and was promptly fired by Ford, which kept a close eye on its employees' nonwork lives. The following year, Walter and Victor embarked on a world tour, hoping to work at the Soviet Union's huge Gorki automobile factory, which Henry Ford had equipped. The brothers spent a year helping train the Gorki tool-and-die workers. Reuther was impressed by Russia's quick transformation into a modern industrial society, but he also saw the repression under Stalin's totalitarian regime, an experience that shaped the brothers' anticommunism during the Cold War. The three brothers played key roles in the major union organizing battles in Detroit, Flint, and other auto industry centers. Walter and Victor returned to Detroit in 1935. Walter never worked on the shop floor again, but channeled his talent and ambitions into building the fledgling auto workers' union. Victor got a job at the Kelsey-Hayes Wheel Company, in Flint, Michigan. Together they led a successful sit-down strike at Kelsey-Hayes, a Ford supplier with 5,000 employees. The strike led to a settlement that doubled workers' wages. Walter and Victor both played roles in the 1936 General Motors strike in Flint, with its now infamous scenes of pro-GM cops attacking workers with billy clubs and tear gas. During the strike, Victor, then 24, drove around Flint in a car equipped with a loudspeaker on the roof, encouraging the "sit-down" strikers who had occupied the factories. The strike spread to over 100 other plants, virtually shutting down GM's production. When the strike was settled, winning many improvements in pay and working conditions, the Reuther brothers' exploits became well-known. In Victor's case, it meant that he and his wife Sophie (the UAW's first woman organizer) had to leave town to evade a warrant for their arrest issued by a pro-GM judge. On May 26, 1937, Walter and other UAW organizers were passing out leaflets at a pedestrian overpass next to Ford's factory complex in Dearborn, Michigan. As the film shows, Ford's private police organization, euphemistically called the Service Department, attacked the union activists in what became known as the "Battle of the Overpass." Newspaper photographers captured Ford's thugs beating Reuther bloody. At a time of widespread pro-union sympathy, the incident was a public relations nightmare for Ford. Even so, it took almost four more years -- until April 1941, when a huge strike shut down Ford's operations -- before the company recognized the UAW and signed a union contract. The Reuthers had many enemies -- among the auto companies, the mob (whose influence within the unions the Reuthers sought to squash), right-wing vigilantes, and opposing factions within the union. In the 1940s, both Walter and Victor were victims of assassination attempts that caused permanent physical harm. The film chillingly recounts these episodes through interviews with friends and family members. The film skips Walter's first major foray into social planning. In 1940, when half the auto factories were idle, he proposed a bold plan to convert idle factories to build 500 military aircraft a day. A brilliant student of industrial engineering and planning, Reuther's plan would put employees back to work, serve a patriotic goal, and put labor on an equal footing with business in planning the war economy. But the auto executives did not want to share decision making with government bureaucrats, much less with union leaders, and they rejected the idea out of hand. Once the nation went to war, however, President Franklin D. Roosevelt frequently consulted Reuther (whom he once called "my young red-headed engineer") on wartime production problems. Anticipating the war's end, Reuther proposed creating a three-part peace production board (with representative from business, labor, and government) to convert defense plants so they could produce railroad cars and workers' housing. To many Americans, this idea seemed like common sense. But business viewed it, correctly, as a radical shift of power, reducing business's influence in shaping the economy. One Detroit auto executive, George Romney (father of former Massachusetts governor Mitt Romney), understood Reuther's genius: "Walter Reuther is the most dangerous man in Detroit because no one is more skillful in bringing about the revolution without seeming to disturb the existing forms of society." When the war ended, Reuther was determined to put the labor movement on a more equal footing with corporate America. In 1946 he led a 116-day strike against GM. Autoworkers' buying power had eroded during the war, and the UAW demanded a 30 percent pay increase without an increase in the retail price of cars. When GM insisted that it could not meet the union's demand, Reuther challenged the company to "open its books." GM refused, but the UAW won an 18 percent wage increase. But Reuther was making a larger point, one he would return to many times, particularly after he was elected UAW president in 1946. By demanding that GM freeze its prices, Reuther was appealing to consumers as well as to UAW members. He argued that the automobile industry -- the largest and most profitable companies in the world -- had a responsibility to society as well as to its stockholders and its workers. And it was the labor movement's responsibility not only to look out for its members but also to use its influence -- at the bargaining table with business and in the political realm with government -- to make America a more livable society for all. "What good is a dollar-an-hour more in wages if your neighborhood is burning down?" Reuther asked, in a speech that unfortunately isn't included in the film. "What good is another week's vacation if the lake you used to go to is polluted, and you can't swim in it and the kids can't play in it?" Using the UAW's clout within the labor movement and with the Democratic Party, Reuther pushed a progressive postwar agenda that included national health care, economic redistribution, full employment, and job security for all. Reuther's call for a progressive social contract among government, business, and labor was too radical for most Democrats, especially as the Cold War was heating up. So Reuther sought to achieve similar goals at the bargaining table, creating, in effect, a private welfare state for those Americans lucky enough to work for the nation's biggest corporations and to have a union contract. In 1948 the UAW got GM to agree to a historic contract tying wage increases to the general cost of living and to productivity increases. Over the next two decades, UAW members won unprecedented benefits, including enhanced job security, paid vacations, and health insurance. In 1955 the UAW won supplemental unemployment benefits that enabled UAW members to earn up to 95 percent of their regular paycheck even if they were laid off. Reuther hailed that provision as "the first time in the history of collective bargaining [that] great corporations agreed to begin to accept responsibility" for their workers during layoffs. The union used strikes -- or the threat of work stoppages -- to gain these victories. It took a strike at Ford in 1949 to establish the union's right to have a voice in the speed of the assembly line. It took a 100-day strike at Chrysler in 1950 to win a pension plan. As a result of these victories, UAW members were able to buy homes, move to the suburbs, send their children to college, take regular vacations, and anticipate a secure retirement. The UAW set the standard for other unions to win similar benefits from other major industries. The UAW was on the front line of the civil rights movement. 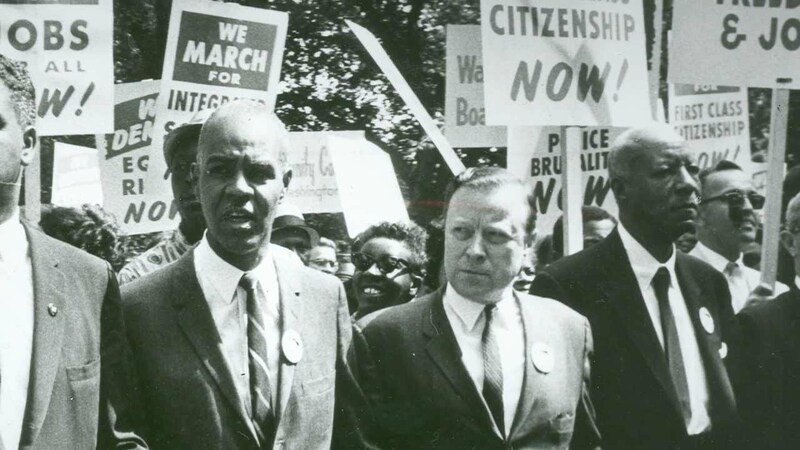 Reuther marched with Martin Luther King Jr. and other civil rights leaders in Mississippi and elsewhere. The UAW helped fund the 1963 March on Washington (which the AFL-CIO refused to endorse) and brought many of its members to the historic protest. Reuther was one of the few white speakers at the march. The UAW used its political clout to lobby for passage of the Civil Rights Act, the Voting Rights Act, and the Fair Housing Act. Reuther was also an early and generous supporter of Cesar Chavez's efforts to organize farmworkers, marched with Chavez on numerous occasions, and supported the boycott of nonunion grapes and lettuce, long before other union leaders recognized the importance of the farmworkers' struggle. Reuther advised Presidents. Kennedy and Johnson to champion a bold federal program for full employment that would include government-funded public works and the conversion of the nation's defense industry to production for civilian needs. This, he argued, would dramatically address the nation's poor, create job opportunities for African Americans, and rebuild America's troubled cities without being as politically divisive as a federal program identified primarily as serving low-income blacks. Both presidents rejected Reuther's advice. They were worried about alienating racist southern Democrats and sectors of business who opposed Keynesian-style economic planning. LBJ's announcement of an "unconditional war on poverty" in his 1964 State of the Union address pleased Reuther, but the details of the plan revealed its limitations. Testifying before Congress in April 1964, Reuther said, "While [the proposals] are good, [they] are not adequate, nor will they be successful in achieving their purposes, except as we begin to look at the broader problems [of the American economy]." He added, "Poverty is a reflection of our failure to achieve a more rational, more responsible, more equitable distribution of the abundance that is within our grasp." Reuther threw the UAW's considerable political weight behind LBJ's programs, but his critique proved to be correct. In 1952 Reuther was elected president of the Congress of Industrial Organizations (CIO) and three years later brokered a merger with American Federation of Labor (AFL) president George Meany. By then about one-third of America's workers were union members. Reuther hoped that the AFL-CIO would spearhead a new wave of union organizing, particularly in the South, but he was constantly frustrated by the indifference of many unions to organizing the unorganized or to mobilizing their members for political action. In 1966 Reuther said, "The AFL-CIO lacks the social vision, the dynamic thrust, the crusading spirit that should characterize the progressive modern labor movement." Two years later he withdrew the UAW from the AFL-CIO and forged a new labor group, the Alliance for Labor Action, with the Teamsters union. Reuther had big plans for the organization, but before it could launch any initiatives, Reuther, his wife, and two others were killed in a private plane crash in 1970. Brothers on the Line does an excellent job of explaining why Walter was reluctant to oppose the Vietnam war, whatever his personal views about that conflict. He had a close working relationship with President Johnson, who endorsed many of Walter's views on civil rights, anti-poverty, and labor issues. The film lets us in on a remarkable phone call between Walter and LBJ in which the president uses all his charm and persuasive powers to convince Reuther to publicly support the war. "I want you to tell the rest of them that I'm no goddamn fascist," Johnson said, referring to Walter's fellow liberals, who were increasingly critical of LBJ's Vietnam policy. After the murders of King and Bobby Kennedy, however, Walter was more open to hearing his children and Victor's arguments against the war and changed his public stance. The film does not overlook two of the most troubling aspects of Walter's ascendancy in the UAW and the labor movement. Although Walter was often at odds with the conservative Meany, who resisted putting more resources into rank-and-file organizing, Reuther shared some of the blame as well. He viewed the Communists within the UAW and the broader labor movement -- who included some of the most experienced and effective organizers -- as a threat. During the Red Scare, he used anti-Communism as an excuse to expel the radicals from the labor movement, weakening its left wing and creating a vacuum filled by more conservative factions. Reuther was also slow to bring more than a handful of black workers into the UAW's leadership ranks. Although Reuther was a powerful champion of civil rights, many African-American autoworkers -- radicalized by the Black Power movement -- were angered by his failure to recruit and groom blacks into the union's top leadership. Under the Reuthers' leadership, the UAW grew to become the nation's largest and most powerful union, with more than 1.5 million members. It has since shrunk to about 355,000 members, reflecting the outrageous mismanagement and declining fortunes of the U.S. auto industry, the relocation of many auto factories to right-to-work states in the South, and increasing competition from European and Asian auto companies. General Motors, once the largest and most successful corporation in the world, is now profitable but employs many fewer American workers. It has been replaced by companies like Walmart, now the world's largest private employer. Walmart -- like GM before it -- has poured enormous resources into fighting efforts by its employees to unionize. Among Walmart's more than one million American workers, there are many potential union leaders -- many of them now part of OUR Walmart -- who will eventually find ways to successfully challenge the company and build a strong voice for employees. Perhaps there are even three sisters who now work at Walmart and will become national leaders in this new wave of workplace organizing. And 25 or 50 years from now, one of their grandchildren will make a film about them -- Sisters on the Line.